When it comes to RC cars and trucks, finding the ones that are actually fast can be tricky. What age are these faster speeds recommended for? Will your child be able to handle these kinds of toys? If these are the kinds of questions that you have, you’ll be glad to know that you’re in the right place. 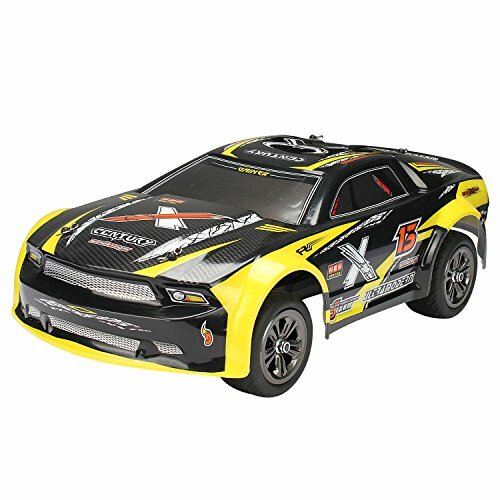 We’ve researched and reviewed what the best fast RC cars for sale have to offer. All you need to do is read through the options below and use the buyers guide to help you feel great about making a purchase. The TOZO RC Car has been made with awesome 2.4Ghz radio technology which allows kids to have precise control over their toy. They can be standing up to 100 meters away from it and still have complete control. We also liked how it has a maximum speed of 30 mph. This is a lot of speed for kids to handle and it can be an absolute blast for them to use in open areas. It has been made with an independent shockproof system as well which keeps it durable and more stable. In addition to this, they have fitted rubber wheels with anti-skid materials added. This ensures that kids can control the RC car on rougher surfaces and still be in control. It can be used on grass, sand, and gravel. We liked how this one can be used on different surfaces due to it’s wheels and independent suspension system. It can also travel at up to 30 mph, which is plenty of speed for kids to have fun with! 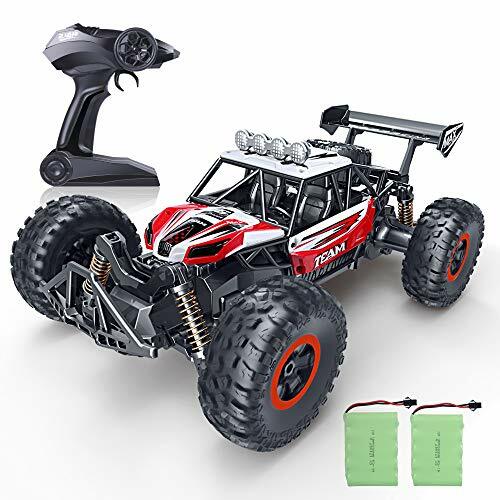 Due to the 4-wheel drive system that has been fitted, this RC car is able to travel across rough surfaces and still provide your little one with plenty of stability and control. We were also impressed with how it can travel at up to 80 km/h! The shockproof body design that’s been used is another feature that makes this one a fantastic choice for taking off-road. It provides kids with more control over the toy while they take it across trickier surfaces. The 2.4Ghz remote that’s included allows for minimal interference to ensure that your child can have responsive controls while being up to nearly 500 feet away. The buggy is also incredibly easy to handle by using the remote. Children have been having a blast taking this one up to 80 km/h while having total control over it by using the responsive remote. With a top speed of 45 km/h, you can be sure that your child will have plenty of fun playing with this one outdoors and testing themselves to see what kind of speed they can handle. They can use the remote to move it in all directions, including a reverse function. We were impressed with how there’s an independent suspension system included. This works effectively to provide the toy with lots of stability while kids are taking it across rougher surfaces. After fully charging for around 2 hours, this RC toy can last for up to 20 minutes continuously. When it’s close to running out of battery, the smart indication lights will blink to let you know. Children have been having a lot of fun with this one and how they’re able to take it across tricky terrain and still have control due to the independent suspension system. This KOOWHEEL RC Car used 2.4Ghz radio technology which ensures that your little one can use the remote to control it without any interference. Therefore, they’re able to have precise control over the toy. It can reach a maximum speed of 40 km/h, which is pretty fast and enables kids to have a blast with it outdoors. After being fully charged, it can last for up to 12 minutes of continuous play. Children also have fun taking this one off-road due to its high-stability steering. The tires that have been fitted are also of a high-quality to provide your child with plenty of control and stability. 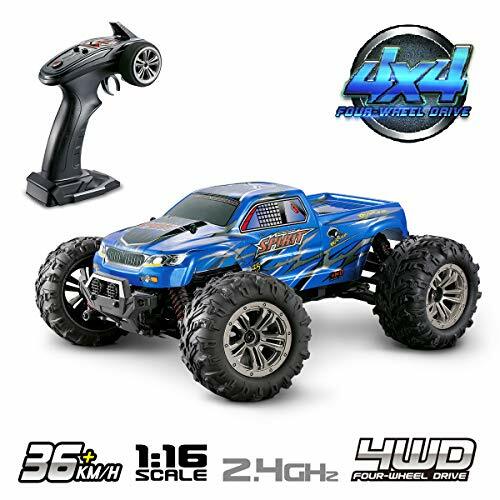 The 2.4Ghz remote, high-stability steering, and high grade wheels allow kids to take this one off-road and have a blast watching how it zooms off at up to 40 km/h. The FunTech’s RC Car has been made to travel at up to 40 km/h, which is a lot of speed for children to have an absolute blast with outdoors. We liked how it has an adjustable speed feature too. This allows kids to select the speed that they’re most comfortable with. Furthermore, they’ve fitted a high-quality braking system that works incredibly well to help kids bring the toy car to precise stops every time. In addition to this, we found that this one can be used on a range of different surfaces. These include grass, mud, sand, gravel, and more. Not to mention there are waterproof materials to keep the electrical components inside safe. This is a great option that lets kids take it across all kinds of terrain, regardless of the weather. The 390 brushed motor that has been fitted into this RC car enables it to travel at a top speed of 30 mph. Therefore, you can be sure that your child is able to have a blast with it outdoors. We were also impressed with the 4-wheel drive feature as it works effectively to provide the toy car with a lot of stability while going across rough terrain. As a result, your little one is provided with plenty of control. This is especially the case since the steering is incredibly responsive. We liked how the remote has an ergonomic design as it’s more comfortable for kids to hold. This RC car can last for up to 30 minutes after being fully charged. This is a fantastic RC car that lets kids take it up to 30 mph while having total control due to the responsive controls and 4-wheel drive. Hosim’s RC Truck has been fitted with 2 powerful motors that enable it to travel at up to 30 mph. Therefore, kids have a lot of power to play around with and test out while being outdoors. They have fitted high-quality wheels to this RC car as well which have a lot of tread. As a result, they have a lot of grip to the surface which allow kids to take it both off and on road and have total control. 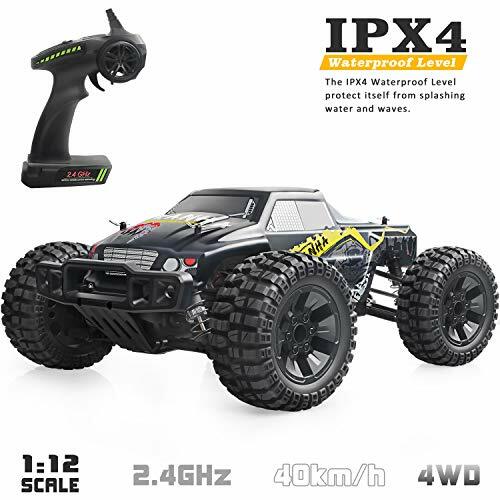 In addition to this, there’s a 4-wheel drive feature which provides the RC car with a lot of stability and support which comes in handy while going off-road. A steel chassis shaft structure has also been included which provides a shockproof benefit too. This is an awesome option that kids can use to take both off-road and on road while having a blast with the 30 mph top speed. 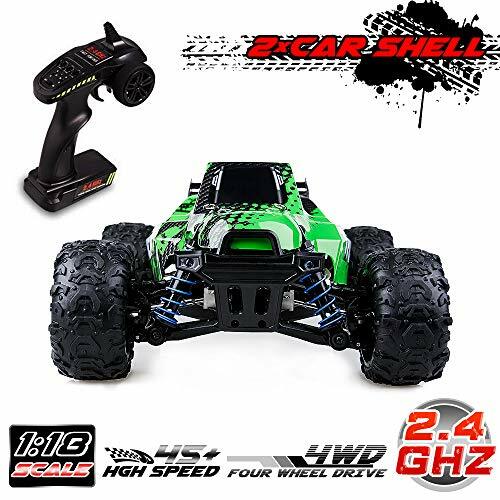 The 2.4Ghz radio technology that’s available with this one enables kids to control their RC car without any interference. Therefore, they’re able to have precise control over it at all times. It can travel at up to 25 km/h which is plenty of speed for children to have fun with outside. We liked how they’ve used high-quality ABS plastic and metal materials to construct this one as it provides it with a lot of durability. Not to mention, there are excellent shock absorbents available too. These work to ensure that the RC car is able to handle rough on-road conditions and still give your child complete control. The anti-skid wheels are also an awesome feature that makes it great for using during wet weather. 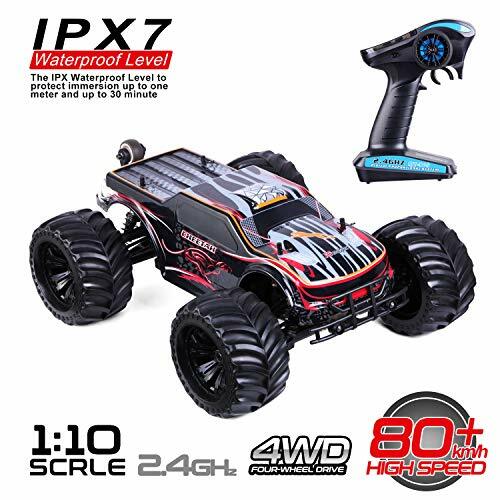 Kids love how they’re able to use this RC car to travel at up to 25 km/h and have precise control because of the 2.4Ghz remote control. The HBX RC Car is able to reach top speeds of up to 30 mph which is plenty to allow your little one to have fun outdoors for hours on end. There’s a 2.4Ghz remote control available too which provides kids with precise control by minimizing interference. In addition to this, the design of this one has been made to be incredibly durable, so you can expect it to last your child for years of play. Waterproof materials have been used to keep the electronics inside safe. Children have been loving how this is an all-terrain RC car. It enables them to take it across gravel, pavement, grass, sand, and more. It has fantastic tires that have been specifically made for off-road riding as well. 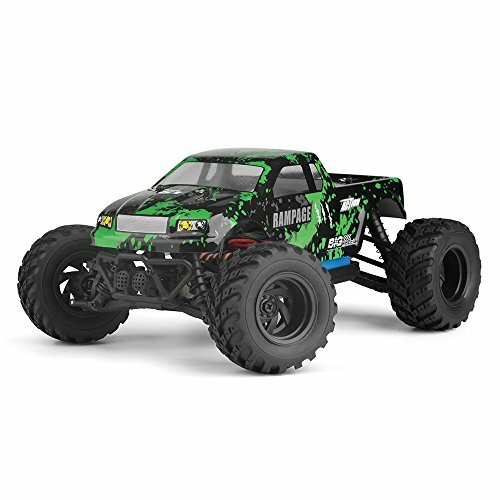 Kids have a blast taking this RC car across off-road surfaces and being able to drive it around at its impressive top speed of 30 mph. Hosim’s RC Truck can travel at a maximum speed of 36 km/h, which kids have been having a ton of fun with. They’re able to have total control over it due to the 2.4Ghz remote control that’s included. This also means multiple toys can be used at the same time to provide kids with a fantastic opportunity to play in groups with other kids. As a result, their social skills can improve greatly. A 4-wheel drive system has been fitted to this RC truck too. This allows your little one to take it across rugged surfaces and still be able to have precise control and stability. We also liked how there’s a suspension system that keeps the truck moving smoothly. We liked how kids can take this truck off-road and be able to take it to its top speed while having complete control due to the 4-wheel drive and suspension system. Kids have been having a blast with this Monster Truck as they’re able to take it off-road and see how well they can control it across rougher terrain. With the high-quality tires available, this truck has plenty of grip to the surface. We also liked how it’s able to travel at a maximum speed of up to 42 km/h. This is plenty of speed for your little one to have a ton of fun with. A 2.4Ghz remote is also available which minimizes interference for precise control. People have also been liking how easy it is to recharge this remote control truck. This is because it comes with a USB cable which is super convenient and reliable to use to keep your child’s toy charged and ready to go. 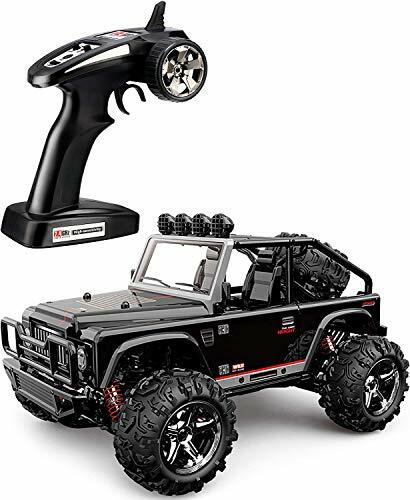 With the off-road tires and high speeds, kids are able to have a ton of fun with this RC truck on all types of terrain. This Distianert Electric Car has an electric 390 brushless motor which works to provide the toy with a top speed of 25 mph. So, you can be sure that your child will have fun taking this one to its speed limits. After being fully charged, this one lasts for up to 30 minutes of continuous play. This is plenty of time for your kids to have fun racing the RC car around outdoors before it needs recharging. We also liked how it has high-quality wheels and an anti-shock suspension system. This means kids can take it on different types of terrain and still be able to control it smoothly. The 2.4Ghz remote also blocks out any interference for precise controls. 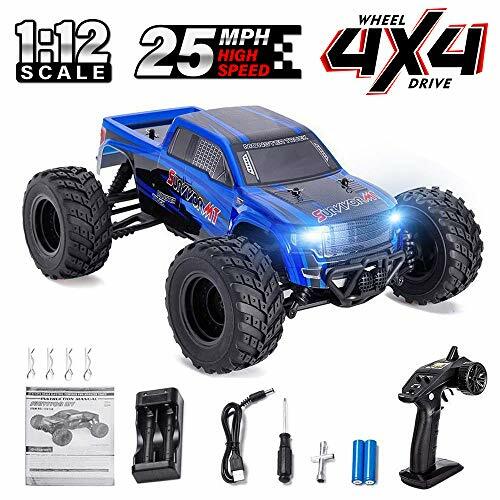 The high grade tires and suspension system mean that kids can take this RC car on different terrains and have a lot of fun being outdoors. We liked how this car comes with 2 LED headlights as it allows kids to play with it in the dark, which is a different playing experience. It’s also great for your little one’s visual learning senses. It can travel at a maximum speed of 30 km/h, which means that your child is provided with some high speeds to play around with. We were impressed with how there’s an S-truck suspension system included as it ensures that kids have a lot of control over the car. A 4-wheel drive feature has also been implemented which is fantastic for providing your child with even more control. 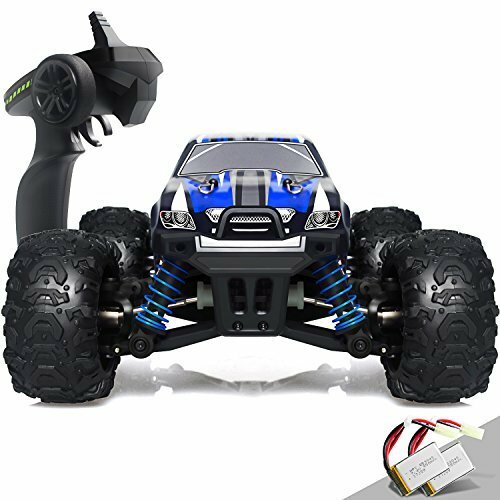 With a 2.4Ghz remote control available, kids can have precise control over the car toy without dealing with any interference. The LED headlights allow kids to play with this one at night which is a fun experience. With S-truck technology and a 4-wheel drive system, your child can also take this one off-road. We were impressed with how this Aiitoy Fast RC Car is able to reach a top speed of 60 km/h. This is a result of the high grade brushless motor that has been fitted. They’ve also made this one to have realistic design features that kids have been loving. Not to mention, an awesome 6-wheel drive feature has been implemented. All of the tires available are also anti-skid which provides your little one with a lot of control, even when they’re going over trickier terrain. The 2.4Ghz remote that’s included is fantastic for minimizing any interference. As a result, your child is able to have precise control over their toy car to turn it in any direction they like. The 6-wheel drive and anti-skid tires are incredibly effective at ensuring that your kids can use this one on rough surfaces and still be able to remain in control. 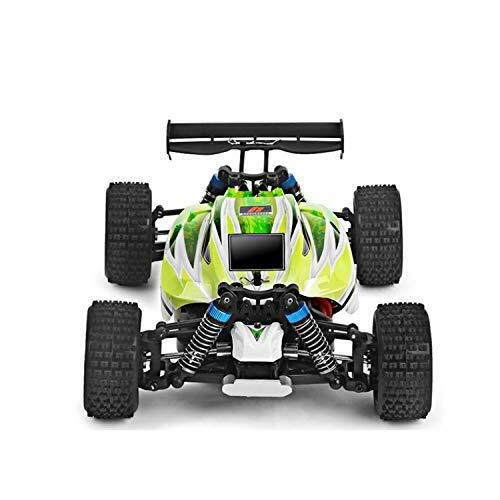 With a 2.4Ghz radio system, your kids are able to have total control over their RC car by reducing any interference. They can also be standing up to 80 meters away and still have precise control. We were also impressed with how it has been fitted with ABS rubber tires, as well as S-truck technology. The tires work to provide kids with stability while going across rougher surfaces. We liked how the S-truck technology is effective at providing your little one with better handling. It can also be charged super easily as a result of the USB charger cable that’s included. 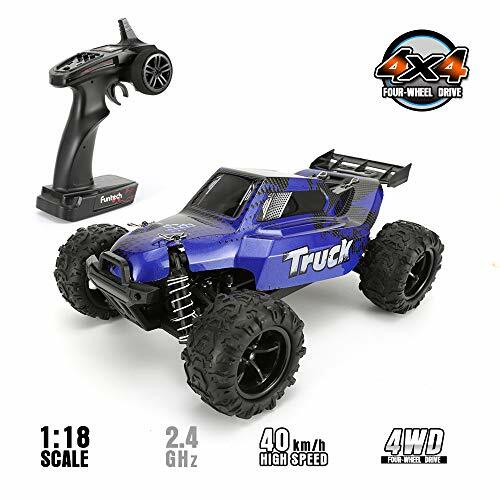 Due to the 2.4Ghz radio system, S-truck technology, and high grade tires, kids are able to have total control over this RC car on all kinds of terrain. 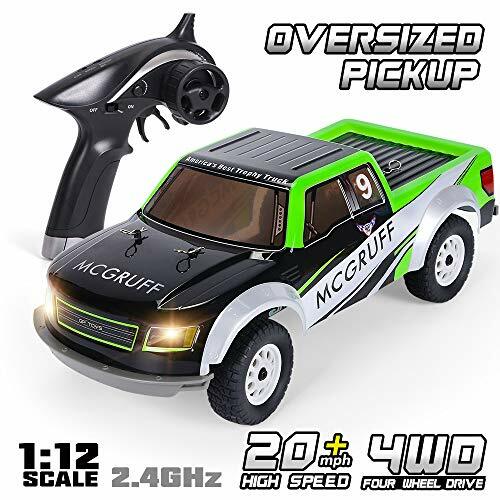 The VCANNY RC Truck comes with a 2.4Ghz radio control system that reduces any interference to allow kids to have precise control over their toy. They can also be standing up to 100 meters away from it. There’s a maximum speed of 40 km/h available, which is pretty fast and fun for kids to enjoy using. We liked how it can be used both on and off-road to allow kinds to be more adventurous. This is a result of the 4-wheel drive system that has been fitted. This provides kids with plenty of control, regardless of whether they’re taking it across sand, mud, dirt, gravel, and more. 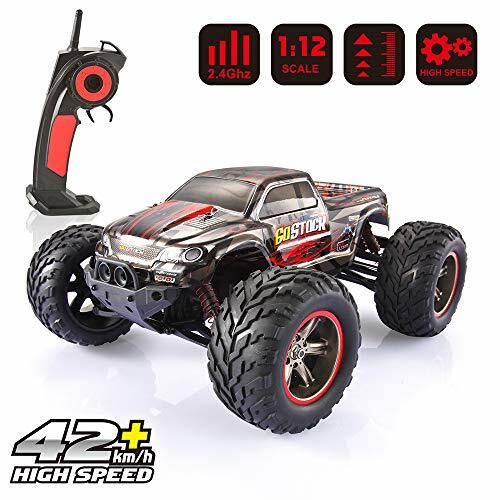 This is an excellent RC truck that has 4-wheel drive to enable kids to take it across tricky terrain and have a blast being more adventurous. This WLtoys car features a 2.4Ghz radio system that minimizes interference to allow your little one to have precise control over their toy. They love taking it to its impressive maximum speed of 70 km/h! With this kind of speed, children feel more encouraged to play outdoors more often. We also liked how it can be used across a range of different terrains as a result of the 4-wheel suspension system and shock absorbent features that have been built-in. These provide the toy with a lot of stability to make sure that your child has plenty of control. In addition to this, there are heavy duty rubber tires which have been made to withstand the high speeds and rougher surfaces. There are currently no bad reviews for this one! The 70 km/h top speed is incredibly fast and allows kids to have an absolute blast being outdoors. So, that concludes our review portion of this post. We hope that you’ve gained a better understanding of what the top fast RC cars have to offer. You can now begin to narrow down your search and find the one that you think your child would enjoy playing with the most. Although, if you’re still not feeling completely certain on which one to choose, you’ll find our buyers guide section below handy. 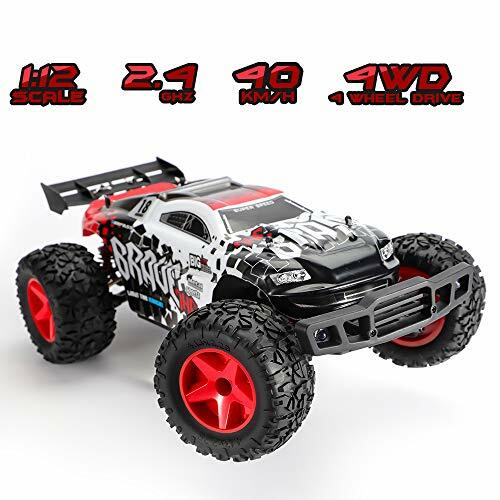 While reading through the various options throughout this review, and carrying out your own research, you will have noticed that there are a few different types of RC cars available. If you were interested in learning more about these different types, take a look at the section below. These electric options are among the most popular in this range. This is because they are super convenient for parents to charge and for kids to use. They come with charging cables that simply require plugging it in. However, their battery life can sometimes diminish a little the more that it gets used. But since their power tends to be more manageable compared to the gas options, they are best for younger children and those who are less experienced with remote control toys . 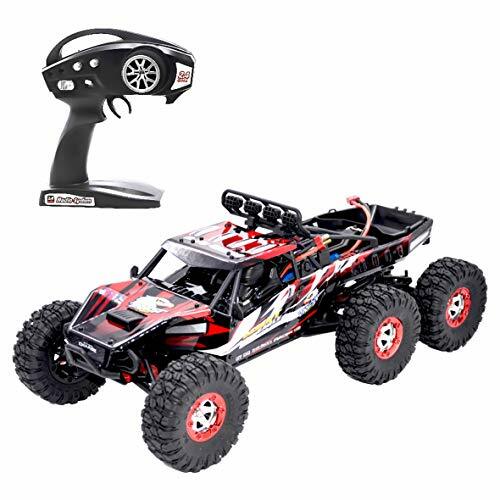 Nitro gas powered RC cars are among the most powerful options that we recommend mostly for teenagers and those who are more experienced with these kinds of toys. It’s also crucial to remember that nitro gas powered RC cars take a specific type of fuel to operate properly. The gasoline powered RC cars are recommended for teenagers and children who are at a more intermediate level. This is because they are typically more powerful than electrical options but not quite as fast as the nitro gas ones. It’s vital that you fill these ones up with the correct gasoline to ensure that they’re able to operate to their full potential. If you were wondering a little more about what some of the top brands of fast RC cars have to offer, the section below is for you! 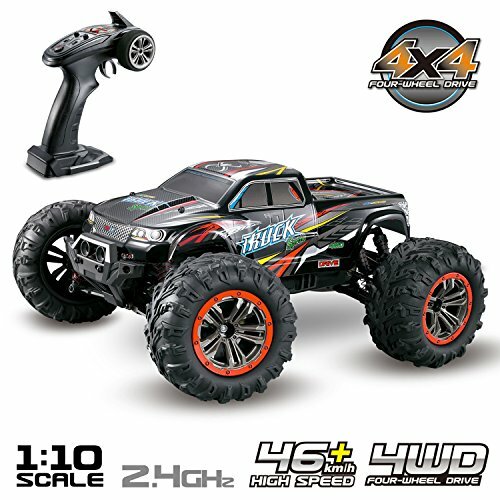 Traxxas is an awesome company that has been manufacturing ready to run RC toys for years. So, you can take them straight out of the box and let your child start playing with it right away. Their range included speedboats, trucks, helicopters, cars, and a selection of accessories that kids can use to customize their playing experience. Distianert are an excellent brand that was founded in 2016 and has been making remote control toys that adults and children have been having a blast with. They make sure to use high-quality materials to ensure that their customers are able to make good use out of their products. GPTOYS is a trusted brand that has been around since 2002. Ever since then, they have been committed to making high-quality hobby items, such as remote control toys, that people have been loving. They put a lot of effort into making sure that all of their products are taken through strict testing procedures. This ensures that their items are of a high standard and are safe for children to play with. That wraps up our review on what the top fast RC cars have to offer. Be sure to consider all of the main features, pros, cons, age recommendations, and what makes each one stand out. The age recommendation is particularly important because these faster RC cars have been made for specific age ranges. This ensures that your child is able to handle them properly and have fun. If you have a little girl you may want to head over to our review of the best RC cars for girls. Hopefully, the information that we’ve provided for you in this review has made you feel more confident about making a final decision!